NASA is again turning to the Taurus rocket to loft a replacement carbon-sniffing observatory after a mishap doomed the first try to launch the crucial environmental satellite. 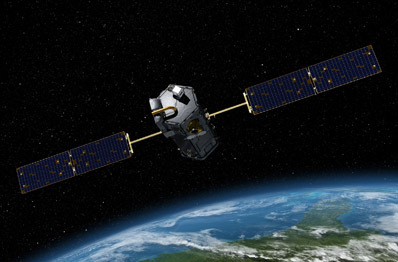 The second Orbiting Carbon Observatory, or OCO 2, will launch in February 2013 on a Taurus XL 3110 rocket from Vandenberg Air Force Base, Calif., NASA announced Tuesday. The launch contract is valued at $70 million, including the launch service, payload processing, mission-unique support, vehicle integration, and tracking, data and telemetry suppport, according to a NASA statement. OCO 2 will pinpoint carbon sources and sinks, or regions where carbon is emitted and absorbed into and from the atmosphere. The 1,170-pound satellite will carry a three-channel spectrometer instrument to detect changing concentrations and movements of atmospheric carbon dioxide, including human-produced greenhouse gases. Orbital Sciences Corp. of Dulles, Va., is the Taurus rocket's operator and builder. The company will also provide the OCO 2 spacecraft, which will be a carbon-copy of the Orbital-built satellite lost in the 2009 launch failure. Tuesday's contract announcement was not surprising because OCO 2 project is supposed to be a clone of the doomed mission. The Taurus XL 3110 vehicle features a Castor 120 first stage motor, enlarged second and third stages, an Orion 38 fourth stage and a 63-inch-diameter payload shroud. All of the rocket's stages consume prepackaged solid propellant. 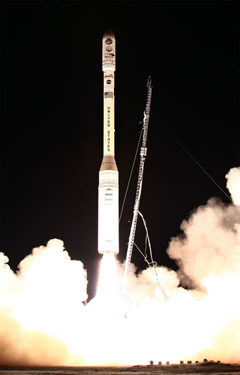 OCO 2's launch will use an identical rocket to the booster that doomed the $273 million first OCO mission after liftoff in February 2009. The Taurus rocket's nose fairing did not separate during the flight, weighing down the accelerating launcher and keeping it from reaching orbit. The fairing was supposed to jettison in two halves about three minutes after liftoff. Investigators were unable to pin down the root cause of the failure, but an independent board found four potential causes of the mishap and recommended fixes for each one. The Taurus rocket is scheduled to return to flight Nov. 22 with NASA's Glory satellite to study Earth's energy budget by measuring atmospheric aerosals and the sun's radiation output. The OCO 2 launch contract gives the Taurus rocket a backlog of two missions. Orbital's air-launched Pegasus rocket also has a pair of flights lined up in 2012, thanks to the addition of another NASA satellite launch awarded earlier this month. The Taurus and Pegasus families cover a niche launch market for small satellites weighing less than 3,000 pounds and 1,000 pounds, respectively. But launch numbers have dwindled for both rockets in recent years, especially the Pegasus, which was a workhorse for U.S. military and NASA missions in the 1990s and early 2000s. "Launch rates are not what they were, but we have a future," said Barron Beneski, an Orbital spokesperson. Military launches have moved to the Minotaur rocket family made of surplus missile parts and Pegasus stages. Foreign businesses and SpaceX's Falcon 1 rocket control the international and commercial markets for light satellite launches. Despite reports the company may close down one of its small rocket families, Orbital will continue supporting launches of both vehicles for the next few years. And there are more modest NASA science missions to be launched beyond 2015. Those could be a good fit for the Taurus and Pegasus. "As long as the flight rate stays about where it is today, I think we'll be OK," Beneski said last week.